University of Vermont employees discuss cost-sharing plan. 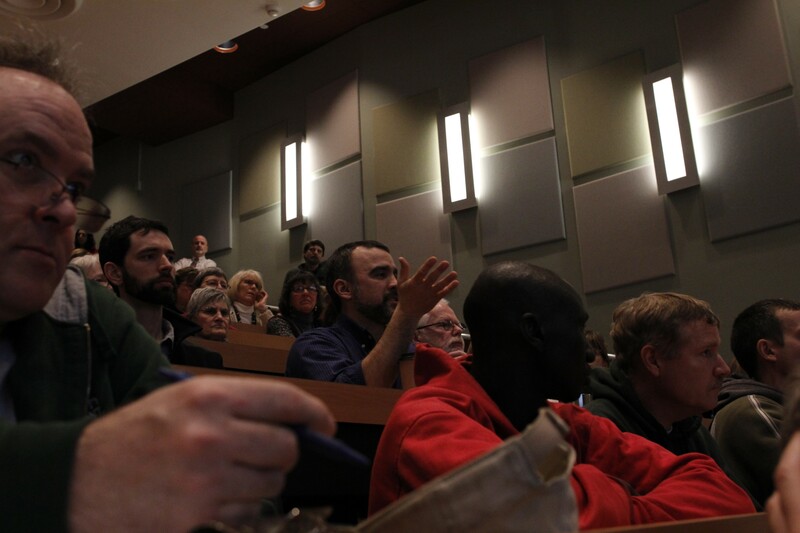 On Thursday morning, a couple hundred University of Vermont employees packed Carpenter Auditorium to express their concerns about potential increases in the amount they pay for benefits. UVM currently offers health care and retirement benefits to faculty and staff, as well as tuition remissions for their children and other dependents. But to make up for lower revenues and increasing costs, the administration is considering shifting some of the cost of those benefits to the employees. The plan, known as “cost sharing,” would take effect July 1, 2014. 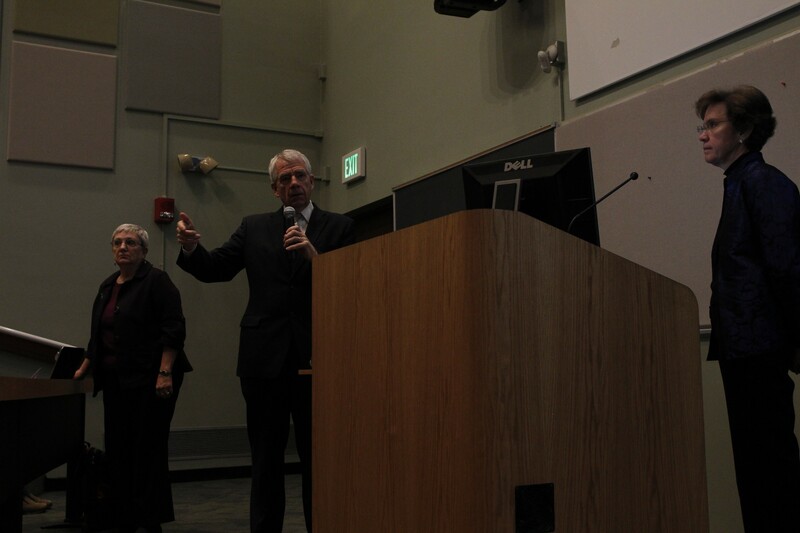 “There’s a pretty significant gap that we had to address,” UVM Vice President for Finance and Treasurer Richard Cate said at the outset of the town-hall-style meeting (which was preceded by a similar forum on Monday). “Some people favor tuition remission more, some favor health insurance more, but in no case is this about having a benefit going away.” The college hasn't made any decisions yet about adjusting benefits, Cate added, and is accepting feedback during the month of February. Jan Carney, an associate dean in the UVM College of Medicine and chair of the University Benefits Advisory Council, then provided some background on the cost-sharing plan and put a question to the employees: Which benefits could be adjusted that would have the least — and most — negative impact on them? In response, about 20 employees spoke into microphones that were passed around the room. Some identified individual benefits. Others refused to indicate a preference and expressed frustration about what they perceived as an unfair distribution of the costs. “You’re asking us to determine negative impacts in aggregate, on an individual basis, and it makes no sense. I’ve used all these benefits over the years, some to a great degree,” said William Valliere, a research specialist in the Rubenstein School of Environment and Natural Resources. "My daughter graduates from this institution this year. I would never have been able to send her here otherwise. I just had a hip replaced last year, and would not have been able to afford that." Richard Cate speaks to UVM employees. 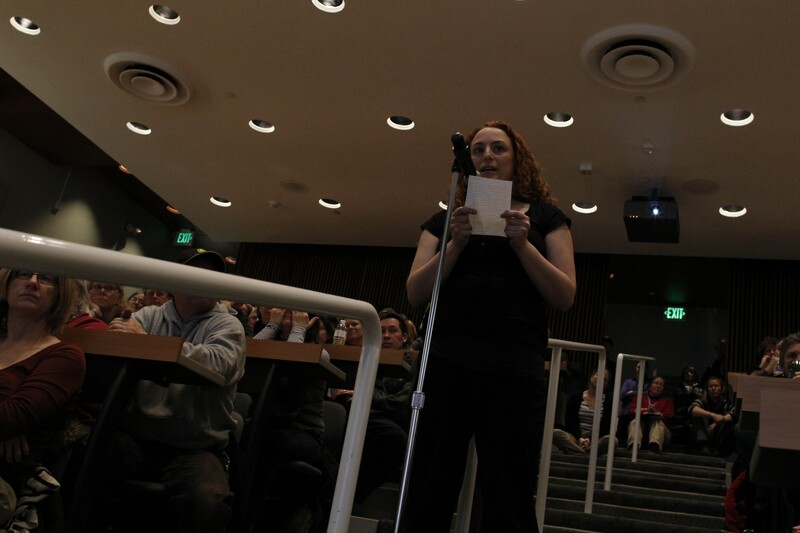 Several other speakers issued similar requests that the university’s leadership absorb more of the blow. In part, those comments may have stemmed from a recent analysis by United Academics, UVM’s faculty union, of employee salary data from 2003 to 2012. That study found the average UVM administrator's salary to have increased by 53 percent in that time, outpacing a UVM-wide pay increase of 39 percent, as well as growth in student enrollment. Cate did not respond to the suggestions that the administration take the lead in cuts, but he did clarify at the beginning of the meeting that the cost-sharing plan was not an attempt to balance the budget “on the backs of the employees … 90 percent of what we’re doing to address the budget has nothing to do with benefits or compensation in any way. A lot of it is in terms of revenue generation, tuition increases, an expanded international program, more distance education.” Cate also mentioned that the increased benefits costs would be offset by salary increases for some employees. Another assurance Cate gave at the beginning of the meeting was that “many employees” need not worry about “the university ... arbitrarily [doing] something” to their benefits, since the school is going through collective bargaining with the various unions on campus. But not all UVM employees belong to a union, and in light of the cost-sharing proposal, there is now an effort to change that. After the meeting, representatives of the Vermont State Employees’ Association were handing out information. Valerie Carzello addresses the University Benefits Advisory Council. That union push parallels one currently underway by employees of Sodexo, the company that handles dining services for UVM and the Vermont state colleges. In an interview after the meeting, Carzello explained that she is very interested in joining a union, but is still “shopping around” for the right one.